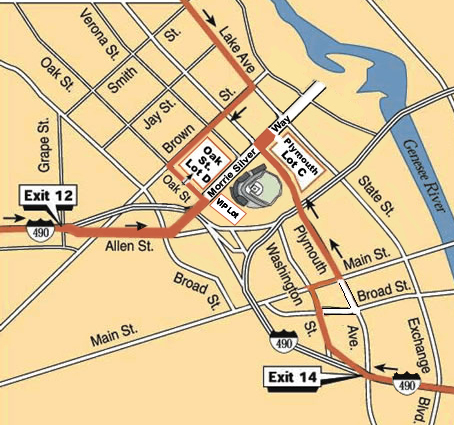 **IMPORTANT TRAFFIC INFORMATION: Roads around Frontier Field will close by 7:45 am on race morning. Therefore, participants for both the 5K & the Kids Marathon need to arrive to Frontier Field no later than 7:30 am. Parking will be available at Frontier Field in Kodak Parking Lot D, located on Morrie Silver Way (across from Frontier Field). There is plenty of free parking. Plymouth Ave will close at 7:45 am and will remain closed until the race is completely over, so if you choose to park in Kodak Parking Lot C (on Plymouth), you will not be able to leave that lot until the roads have been re-opened. We advise that participants for Sunday's Marathon, Half Marathon & Marathon Relay park at Frontier Field. There is plenty of free parking. Shuttle buses will be provided to take you from Frontier Field to the start line at Maplewood Park starting at 5am. The last bus will leave Frontier Field at 7am. You can find these shuttle buses at the corner of Morrie Silver Way & Verona St. When you finish the race, you will be right by where you parked your car at Frontier Field. We HIGHLY ADVISE that you do not wait to get on the shuttle buses. If you wait until the last shuttle bus at 7:00 am, we can not guarantee that you will make it to the Start on time. The race will start promptly at 7:30 am. Spectators are allowed to take the shuttle buses to the Starting Line. There will be shuttle service from Maplewood Park back to Frontier Field after the race starts. However, shuttle service back to Frontier Field will only be available immediately following the start. It will not continue throughout the day. No cars will be permitted to drive to the Start Line to drop off participants. FROM WEST: Take Rt. 490 East to Exit #12 (Brown/Broad). After exiting the expressway, you will come to a traffic signal; continue straight on to Allen Street. You will come to a traffic signal; keep left and continue across Broad Street past the Fire Station (follow the Frontier Field signs). As you approach, Frontier Field will be on your right. Participant & spectator parking is available in our D Lot, located on your left. FROM THE NORTH: Take Route 390 South; exit onto Route 490 East and go to Exit #12 (Brown/Broad). Continue straight on to Allen Street. Continue on Allen across Broad Street past the Fire Station (follow the Frontier Field signs). As you approach, Frontier Field will be on your right. Participant & spectator parking is available in our D Lot, located on your left. FROM THE EAST: Take Rt. 490 West past the downtown exit to the Plymouth Avenue (Exit #14). Continue straight off the exit to Broad Street and turn right. The first traffic signal is Plymouth Avenue. Turn left and continue for approximately 1/3-mile. Frontier Field will be on your left. Turn right at the light (Morrie Silver Way) and you will find parking available for participants & spectators in C Lot on your right. FROM THE SOUTH: Take Rt. 390 North to Rt. 490 East to Exit #12 (Brown/Broad). After exiting the expressway, continue straight on Allen Street. Continue on Allen across Broad Street past the Fire Station (follow the Frontier Field signs). As you approach, Frontier Field will be on your right. Participant & spectator parking is available in our D Lot, located on your left.